Dental Questions? We Have Answers. Hello Derry! Vanguard Dental Group, has been serving the Derry area since 1999. If you have questions about oral health, cosmetic dentistry, preventative dentistry, children’s dental sealants, tooth implants, oral sedation, safe teeth whitening, or invisible braces, come to Vanguard Dental Group for answers. My high tech staff has helped me create an atmosphere of active listening. We enjoy getting to know our patients and determining each patient’s unique needs. We want to understand your dental goals and challenges and help you understand the hows and whys of recommended treatment. We are currently accepting new patients. If you are seeking a friendly children’s dentist or cosmetic dentist in Derry, we invite you to come in and meet our high tech team. Many of our new dental patients ask us about cosmetic dentistry procedures such as teeth whitening, smile makeovers and dental implants. 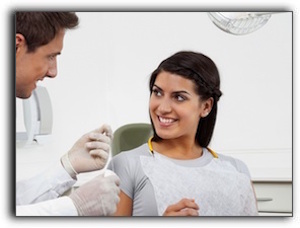 We would love to speak with you about these procedures as well as our other dental services. If you have small children, it is important for you to make decisions about protective sealants and fluoride supplements. If you have older children, it is helpful to discuss braces, sports mouthguards, and tooth decay prevention. If you are not happy with your smile, we would like to introduce you to the latest in cosmetic dentistry. If you are missing teeth, dental implants may be the prime solution. If you have a family member with a chronic illness, we can counsel you about the impact their condition has on oral health. Oral cancer screenings are essential for patients of all ages. Thank you for visiting our dental blog and taking the time to learn more about Vanguard Dental Group. Call today to schedule a consultation.